Hmmm, earlier this morning, we took a look at a device that offers your whole body pinpoint massage as well as infra-heat relief, but this time around, here is a device which specifically targets your neck and neck alone. Yes sir, we are referring to the $149.95 Heat Therapy Neck Massager, where you wear it behind your neck just as though it is a shirt collar cradling the back of your neck. 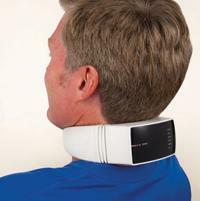 The collar massager claims to be able to help relieve neck tension using low-frequency electric pulses and heat. When used in the hands of professional therapists, it is ideal to help relieve muscle pain and strain which is commonly obtained from driving, flying, or office work. The massager itself slips around the neck in a comfortable manner, where it delivers half a dozen combinations of varying vibration intensities and heat, and all of these can be controlled from the included infrared remote. There will also be six vibration modes that help simulate the gentle kneading of a Swedish neck massage, as well as deliver the invigorating pressing and rolling of a deep tissue massage. As for the pair of elements that are integrated right into the collar, those deliver three levels of far-infrared heat which can penetrate neck muscles for optimal relaxation. You will be able to choose from sessions in 5-minute increments up to 30 minutes, and a full battery charge offers up to 30 minutes of pure bliss.